This October, fulfil your dream of travelling to Makkah to perform Umrah. At I’timaar, we are determined to help you realize your spiritual aspiration of visiting Kaabah and kneel down before Allah (SWT) to beseech Him for forgiveness. Our customized October Umrah packages are designed keeping in mind, both your comfort and point of interest, and help you plan and prepare for this journey of a lifetime. We ensure that you complete all the rituals with ease while performing Umrah and no hindrances occur on your spiritual journey. October is a good time for Umrah with considerably better weather and low humidity. It is also less crowded with a low number of pilgrims in Makkah, which means you have the opportunity to explore all the ziyarat places of Mecca and Medinah in a relaxed way and without any hassle. Airfare and hotel rates also get reduced, therefore, costing your trip much less. You can perform all the rituals easily and also get a chance to kiss the black stone [Hajr-e-Aswad] which is next to impossible during peak season. With an extensive experience in the field of planning Hajj & Umrah tours and a team of experts, Itimaar takes care of every detailed aspect of your stay in Makkah and Madinah. We ensure that you not only complete your Umrah but also explore the other important Ziyarat places in Makkah and Madinah. Our Cheap October Umrah packages offer you a hassle-free journey to Makkah to fulfil your wish of visiting Kaaba and performing tawaf. Umrah is considered a sacred journey in Islam that every Muslim dream of performing. While there are specific dates for Hajj annually, there is no restriction for Umrah and can be performed at any time of the year. If you want to perform Umrah in October, you must know the best October Umrah package deals and facilities offered by various travel agencies that are willing to provide the customers with the best amenities in very affordable rates. Spend your holidays in a productive manner by going on Umrah in October with your family and loved ones. You will not only be able to fulfil your duty towards Allah (SWT) through the performance of Umrah but also be able to connect to Him and get the spiritual satisfaction during this sacred journey. We offer cheap October Umrah packages and the most affordable Umrah deals to help you fulfil your dream of going to this sacred pilgrimage. The Umrah packages are crafted considering the number of pilgrims at a specific time while keeping the group short. We provide all the facilities including accommodation, transport, airport transfer and Ziyarat in Makkah and Madinah, ensuring that your Umrah remains hurdle-free and fulfilling. October is one of the best months to perform Umrah because of the lesser crowd and comparatively milder weather. I’timaar has come up with exclusive October Umrah packages 2019 to facilitate your Umrah with utmost peace of mind and comfort. With a goal to serve our customers in the best possible manner, we provide the best facilities in the most economical price. 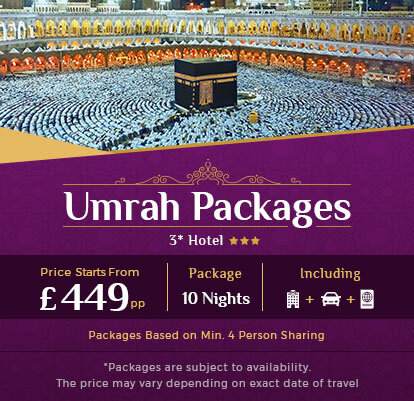 I’timaar offers a wide range of October Umrah packages to make sure you get the package with your desired Hotel for a required number of days. We try to fulfil your deepest desire to perform Umrah in the most affordable price. With an aim to help you to plan your Umrah tour with your family and loved ones in October, we have customised special group Umrah October packages to make your autumn vacation unique and extraordinary. 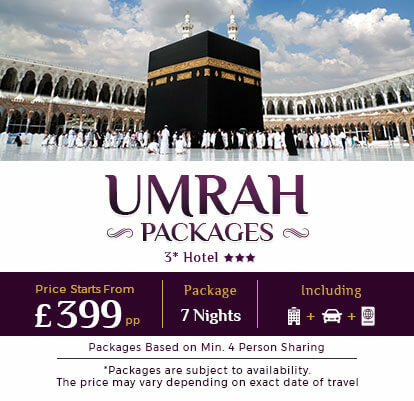 A leading travel agency in UK, I’timaar specialises in offering special discounts on Umrah packages resulting in the cheapest price available. Providing luxurious and personalised services, we help you pre-plan your October Umrah ensuring you perform this sacred journey with ease. What better way to spend your holidays than performing Umrah and travelling to the holy cities of Makkah and Madinah? You have the option to choose the departure date in October and the airport from where you want to board your flight to Jeddah. Heathrow airport is the most popular place to depart for Umrah tour. You can also choose to stay in Makkah or Madinah initially. If you are willing to go on Umrah with your entire family in October, you can opt for our best October Umrah deals to get advantage of exclusive discounts during your trip to the holy cities. We offer special prices for group packages to make sure the entire tour costs minimum. Married couples with kids can also take their children with them on Umrah. We carefully craft our Umrah packages ensuring individuals can easily perform this sacred pilgrimage at the minimum cost. The pilgrims travelling are often allocated hotels on sharing basis. Special attention is given to the senior citizens and disabled persons going for Umrah while ensuring wheelchairs and ground floor accommodation for them. Being ABTA, IATA, and SAFI certified and ATOL protected travel agency in UK, we are authorised to book your Umrah packages and hotels in Makkah and Madinah. With our 3-Star, 4-Star and 5-Star October Umrah packages 2019, we cater to every budget letting you a chance to perform Umrah comfortably and within your budget. Perform the holy ritual with your stay at well-furnished hotels in Makkah and Madinah. Our special October Umrah packages include fast visa processing and accommodation near Masjid-ul-Haram and the Prophet’s Mosque to make sure that you do not have to travel much to reach the two holy mosques. You can also choose luxury with affordability by opting for our 4-Star Umrah packages which are especially popular among families performing Umrah. If you want to stick to the budget and looking for cheap October Umrah packages from UK, you can go for our 3-Star packages with stop-over flights and economy hotels stay. You also have the option to pick your desired airline and hotel stay in Makkah and Madinah during your Umrah. A trip to Makkah and Madina would be incomplete without going for Ziyarat. Most of our Umrah packages include Ziyarat of historical and Islamic sites to peek into the history of Islam and the various places related to the life of the Prophet (PBUH) and his companions. The pilgrims can also choose to travel to Madinah from Jeddah via high-speed railway network that takes only 45 minutes to reach. Your guided tour includes well-informed travel guides who make sure that you remain updated with Islamic history. With numerous satisfied Muslim brothers and sisters who performed Umrah with us, makes us one of the most preferred Umrah tour operators in UK. We let you book your sacred journey according to your needs while ensuring value for money with fast visa processing. Our Hajj & Umrah travel experts will make sure that you are provided the most appropriate October Umrah package with world-class facilities at the cheapest prices. Exclusive discounts are offered to customers making reservations in advance. We consistently try to make your Umrah journey extra special and memorable by providing personalised services at economical rates. Talk to our travel experts to plan your Umrah in October.